Today's share is a new series I'm starting called One Stamp Set, Three Cards. I'll be posting these weekly here on my blog and eventually we'll make this a video series. Stay Tuned! We're using the Sealed with Love stamp set that you can also get as a bundle from the Occasions Catalog that includes the coordinating dies. Super cute set for Valentine's Day. I've created an instructions sheet for these cards that you can download HERE! And you can see the supplies I used with links down below. 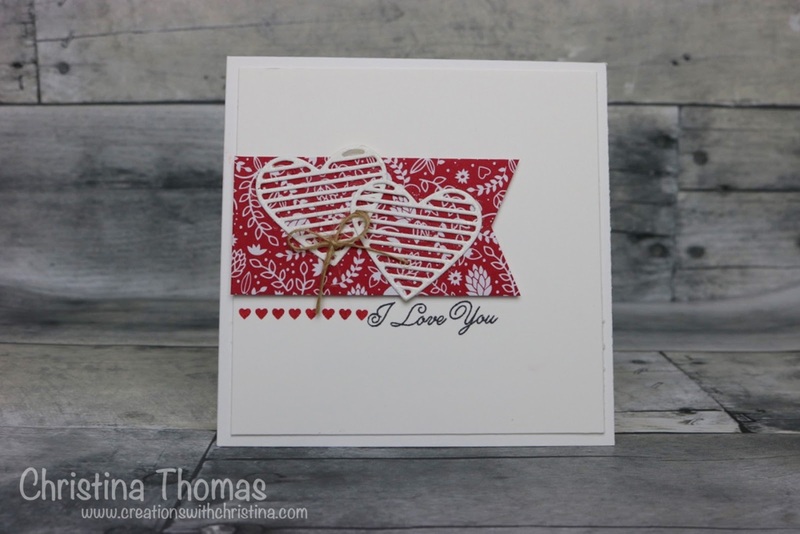 The first card is a 4-1/4" card that I stamped with the small hearts stamp in Real Red ink and the I Love You sentiment with Memento Tuxedo Black ink. I die cut those adorable hearts with the coordinating die set from the Occasions Catalog in Whisper White card stock and then added a small linen thread bow. I love these bows for adding a little bit of texture to a card. The pattern paper is from the Sending Love Designer Series Paper (DSP) pad. 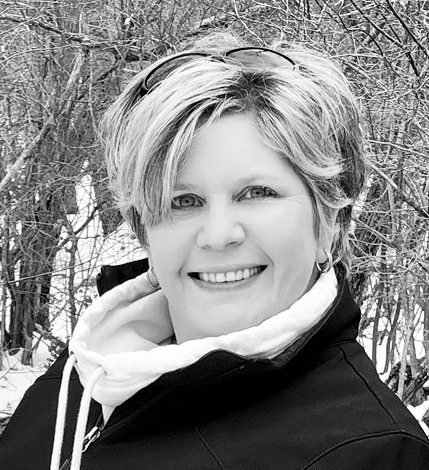 The next card is a standard size card (4-1/4" x 5-1/2") with Whisper White Yardstick. 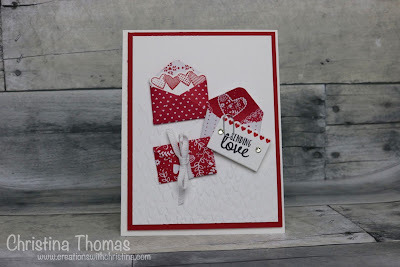 I used Real Red cardstock to create a mat piece for the Whisper White cardstock that I embossed with the Falling Petals Embossing Folder. Using the coordinating dies I die cut the small envelopes with DSP from the Sending Love Paper Pad and the notecards with Whisper White cardstock. I stamped the small hearts border that I used in the first card on the mini notecard with Real Read ink and added the sentiment Sending Love with Memento Tuxedo black ink. One envelope I closed and tied with a ribbon. For the last envelope I added the notecard that I stamped in Real Red ink with the little hearts cluster. The last card is another standard size card. The card base is done in Whisper White Cardstock. I thought it would be fun to stamp out my own pattern paper. 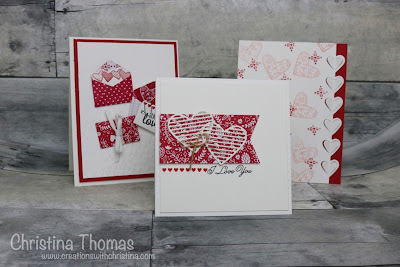 Before I did that, I die cut that really cool heart border from the die set on the right, then stamped my background using the cute floral heart with Blushing Bride Ink and for a pop of color I added a little filler stamp with Real Red ink. I love the color combo. The sentiment Hello Love was stamped in the Memento Tuxedo Black ink to make it pop off the page. So those are my cards for this first post in the series. If you are ordering under $150 use this Hostess Code N2F69MCW to be entered into a drawing to win Hostess Rewards. Orders over $150 will receive their own rewards at checkout, so please do not use the Hostess Rewards. I love that heart border die. All the cards are great, Christina. The cards are all so pretty, but the last one with the border is my favorite! Thank you for sharing them. Christina these cards are beautiful!!! I love that last card!!! These are all so fabulous for Valentine's day and anniversaries.... Love them all my friend! I love this idea for a series. I know I never use my stamp sets to their full potential. It's great to see lots of ways to use the same stamps, can't wait to see more.